The Velvet by Graham and Spencer Prima sequin top is a sophisticated day-to-night garment that's perfect for party season. 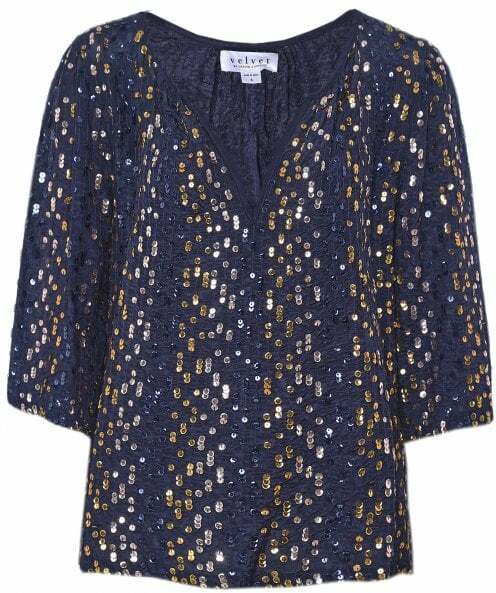 Crafted from an easy woven fabric that features vertical sequin stripes in tones of gold, pink and navy blue, this top is a relaxed statement piece, with subtle ruching around the neckline and 1/2 length sleeves. Wear with dark wash jeans and heels for a glamorous evening look. 33" 34" 35.5" 37.5" 40"
25.5" 26.5" 28" 30" 32.5"
36" 37" 38.5" 40.5" 43"